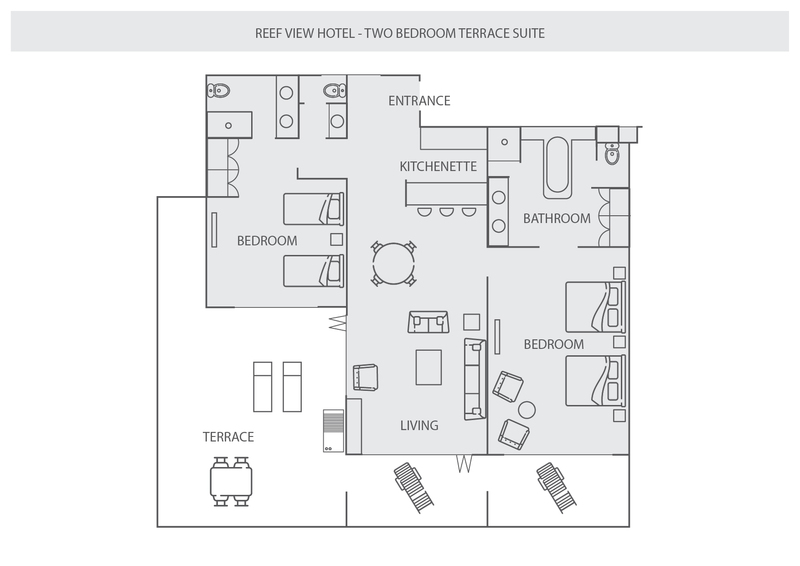 With luxury features, a vast entertaining area and two spacious bedrooms, the Two-Bedroom Terrace Suite is your home away from home. Spacious, bright and airy, the Two-Bedroom Terrace Suites are perfect for entertaining, and open onto a large, wraparound terrace, with incredible views over the Coral Sea. The large terrace and BBQ area - perfect for enjoying the balmy nights. Two spacious bedrooms, and a large separate lounge and dining area where you can relax and unwind. The magnificent, wraparound views out over the Coral Sea and Whitsunday Islands. The bright, airy, open feel. Please be aware that functions or group gatherings are not permitted in our Two-Bedroom Terrace Suites. However, if you do wish to organise a private function, there are plenty of ideal venues around the island to choose from and our reservations team are very happy to help. Contact our reservations team to learn more. The 17th floor of the Reef View Hotel, directly opposite Catseye Beach. Enjoy amazing views out over the Coral Sea and Whitsunday Islands. Two queen-size beds and one king-size bed, or two single beds. The relaxed manner of the whole resort ... being able to have breakfast at 10 am is GREAT means we can sleep in! Size of room and location. Fabulous scenery, friendly staff, and they were hardworking. Great location with beautiful views over the water. Nice spacious bright rooms. Our suite was fabulous and the service was excellent! We enjoyed the breakfast options and the beach activities. The view from room 1918 was amazing. The convenience and location to the pool and beach. Having a buggy to get around in at our disposal during our entire stay was key as well. Our suite had great views and was perfect for our family. Reef View staff were very good. Great service, friendly and attentive stuff, very well organized. The things I enjoyed most while staying at the hotel was the view, the spa, the dining, the activities offered, the room and the wonderful service. It was a fantastic place for a holiday. The staff were amazingly friendly and helpful. We were surprised at the level of service provided. The views from our room were amazing!